Fernando Botero was born the second of three sons to David Botero (1895-1936) and Flora Angulo (1898-1972). David Botero, a salesman who traveled by horseback, died of a heart attack when Fernando was four. His mother worked as a seamstress. An uncle took a major role in his life. 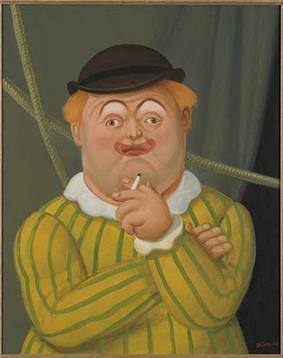 Although isolated from art as presented in museums and other cultural institutes, Botero was influenced by the Baroque style of the colonial churches and the city life of Medellín while growing up. He received his primary education in Antioquia Ateneo and, thanks to a scholarship, he continued his secondary education at the Jesuit School of Bolívar. In 1944, Botero's uncle sent him to a school for matadors for two years. In 1948, Botero at age 16 had his first illustrations published in the Sunday supplement of the El Colombiano, one of the most important newspapers in Medellín. He used the money he was paid to attend high school at the Liceo de Marinilla de Antioquia. 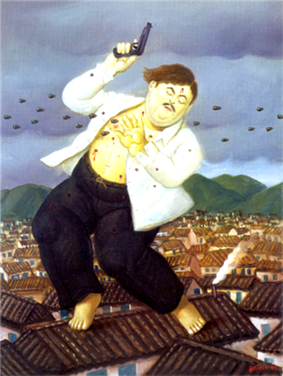 Botero's work was first exhibited in 1948, in a group show along with other artists from the region. Botero is an abstract artist in the most fundamental sense, choosing colors, shapes, and proportions based on intuitive aesthetic thinking. Though he spends only one month a year in Colombia, he considers himself the "most Colombian artist living" due to his isolation from the international trends of the art world. 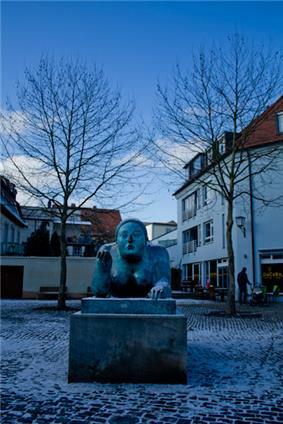 In 2005 Botero gained considerable attention for his Abu Ghraib series, which was exhibited first in Europe. He based the works on reports of United States forces' abuses of prisoners at Abu Ghraib prison during the Iraq War. Beginning with an idea he had on a plane journey, Botero produced more than 85 paintings and 100 drawings in exploring this concept and "painting out the poison". The series was exhibited at two United States locations in 2007, including Washington, DC. Botero said he would not sell any of the works, but would donate them to museums. In 2008 he exhibited the works of his The Circus collection, featuring 20 works in oil and watercolor. In a 2010 interview, Botero said that he was ready for other subjects: "After all this, I always return to the simplest things: still lifes." Between 1963 and 1964, Fernando Botero attempted to create sculptures. Due to financial constraints preventing him from working with bronze, he made his sculptures with acrylic resin and sawdust. A notable example during this time was "Small Head (Bishop)" in 1964, a sculpture painted with great realism. However, the material was too porous and Botero decided to abandon this method. 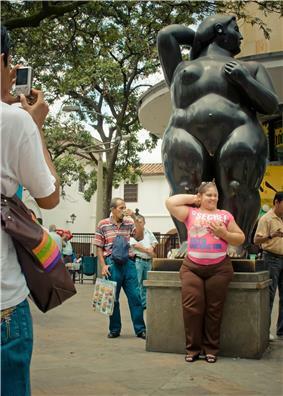 Botero Plaza in his hometown of Medellín is a popular tourist site for taking pictures. 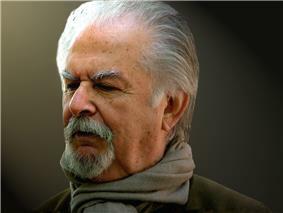 Botero has donated several artworks to museums in Bogotá and his hometown, Medellín. In 2000, Botero donated to a museum in Bogotá 123 pieces of his work and 85 pieces from his personal collection, including works by Chagall, Picasso, Robert Rauschenberg, and the French impressionists. He donated 119 pieces to the Museum of Antioquia. His donation of 23 bronze sculptures for the front of the museum became known as the Botero Plaza. Four more sculptures can be found in Medellín's Berrio Park and San Antonio Plaza nearby. 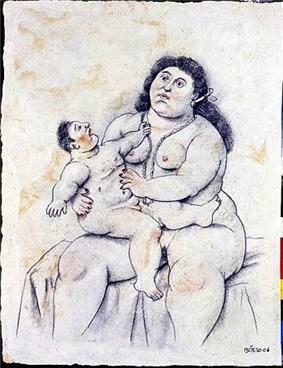 Botero married Gloria Zea (who became the Colombian Minister of Culture). Together they had three children: Fernando, Lina, and Juan Carlos. The senior Boteros divorced in 1960 and each remarried. Starting in 1960, Botero lived for 14 years in New York, but more recently has settled in Paris. Lina also lives outside of Colombia, and in 2000 Juan Carlos moved to southern Florida. Fernando Botero Zea became a politician and served as Defense Minister. He was convicted in 1996 of a financial offense and served 30 months in prison. Rather than facing a second charge and sentence in 2002, he relocated to Mexico, where he is a citizen by birth. Lina Botero became an actress and TV presenter. In 1964 Botero began living with Cecilia Zambrano. They had a son, Pedro, born in 1974, who was killed in 1979 in a car accident in which Botero was also injured. Botero and Zambrano separated in 1975. Last Botero married the Greek artist Sophia Vari. They reside in Paris and have a house in Pietrasanta, Italy. Botero's 80th birthday was commemorated with an exhibition of his works at Pietrasanta. "Fund-Raiser" Exhibition with Sonia Falcone at Calvin Charles Gallery  (2003), Scottsdale, Arizona. "Botero at Ebisu" (2004), Tokyo. 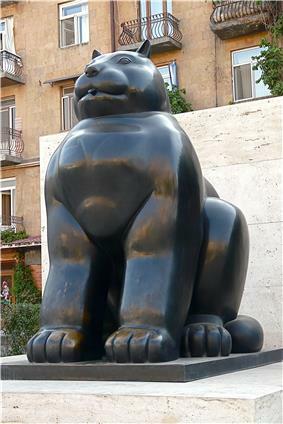 Botero's Cat at the Cafesjian Museum of Art in Yerevan, Armenia. 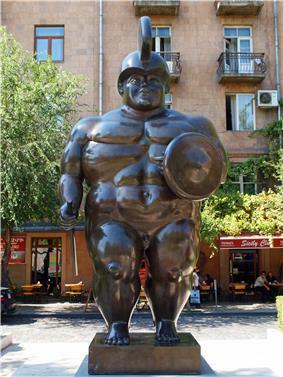 Botero's Roman Warrior, Cafesjian Museum of Art, Yerevan, Armenia. Man on Horse, bronze, 1992, at the Israel Museum, Jerusalem, Israel. 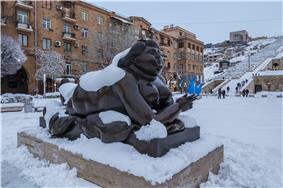 Botero's Smoking woman at the Cafesjian Museum of Art, Yerevan, Armenia. ^ Kristin G. Congdon; Kara Kelley Hallmark (2002). Artists from Latin American Cultures: A Biographical Dictionary. Greenwood Publishing Group. p. 40. ^ a b John Sillevis (2006). The Baroque World of Fernando Botero. Yale University Press. ^ Michael J. LaRosa; Germán R. Mejía (5 April 2012). Colombia: A Concise Contemporary History. Rowman & Littlefield Publishers. pp. 168–. ^ Lorrain Caputo. VIVA Colombia Adventure Guide. Viva Publishing Network. pp. 624–. A Permanent Accusation on YouTube A short movie on the Abu Ghraib series by Fernando Botero. Abu Ghraib: November 6 - December 30, 2007 It has been announced by the Director and Curator of the American University Museum at the Katzen Arts Center in Washington, D.C. that Botero's paintings will be exhibited there at the end of this year. Abu Ghraib: January 29 - March 25, 2007 The first US institutional exhibition at UC Berkeley, with a webcast of a conversation between Fernando Botero and Robert Hass on the day of the opening. Abu Ghraib: October 18 - November 21, 2006 The first US gallery exhibition at the Marlborough in New York. The Body in Pain this essay by Arthur Danto at The Nation about Botero's Abu Ghraib series, discusses what Danto refers to as "disturbatory art"
Botero Sees the World's True Heavies at Abu Ghraib by Erica Jong at The Washington Post about Botero's Abu Ghraib series"